Hi, I’m Sydney Opposum! The annual Opossum Cotillion is coming up but all the Opossums at school say I’m not pretty enough to go! Can you help me fit in farmer? 1. I think I’ll go into the village for a full make-over but first I have to help Papa with the crops. Can you help me? Then you can come to the Village with me for my make-over! 2. Beneath a the grand Saguaro Tree is a luxurious Opossum Spa. Here, I will get my claws shaped and my make up done. Soon I’ll be so beautiful you won’t even recognize me! 3. Make-over’s done! Time to go to school; but I still don’t feel pretty. Actually I feel heavier than a Buffalo with all this make-up. Maybe some cheery nail polish wil help. 1. AHA! I’ve got it! 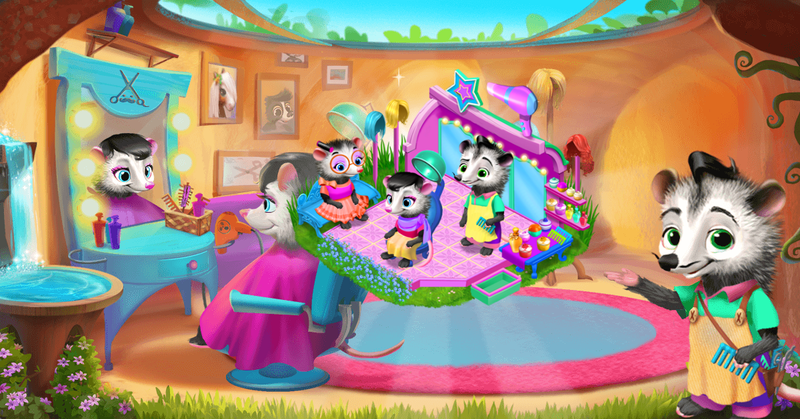 Imma have a healthy dinner, put on a new dress and head to Henry’s Hair salon to give to get coolest opossum haircut the world’s ever seen! 2. Henry cut my hair PERFECTLY as I told him all about my issues! The only thing was I didn’t have any money left to pay him so I made sure to give him lots of gifts instead! 3. When Henry finished my hair, he turned me around to face the mirror and WHOA! I looked gorgeous…so gorgeous I was definitely ready for the Cotillion; just one problem! 1. Suddenly, a little ol’ opossum named Mae popped out from behind some plants in Henry’s Salon. She overheard EVERYTHING! That’s when she gave me this life-changing advice! 2. She said, “Dear opossum, beauty’s how you feel INSIDE! Ponder a Rose or a hand-crafted Clay Pot, both beautiful in their own ways and neither wish to be something they are not! 3. Hearing those words something clicked! Ya, I AM beautiful in my own way and I quite like me! So I washed up, got dressed and went to that Cotillion looking exactly like ME! 4. I marched through those Cotillion doors looking the same as always did but THIS time my only make-up was a SMILE; just a genuinely, confident opossum smile! what are the materials you get in 84+?? Page generation time 0.0505 sek.